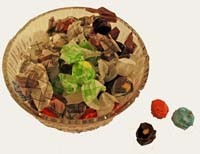 Dorothy's Salt Water Taffy is always chewy -- always delicious. Our Summer variety includes a variety of fruity flavors, like blueberry and watermelon. Also contains old faves like chocolate-peanutbutter saltwater taffy. You don't even have to go to the shore!